This colourful shrine is considered the guardian shrine of neighbouring Gion (“Gion” refers to a Buddhist guardian deity). Yasaka Shrine, also known as Gion Shrine in Higashiyama-ku, Kyoto is believed to have been built in 876. Deities enshrined here are the god Susano-o-no-Mikoto, his consort Kushinada-hime-no-Mikoto, and their son Yahashira-no-Mikogami. 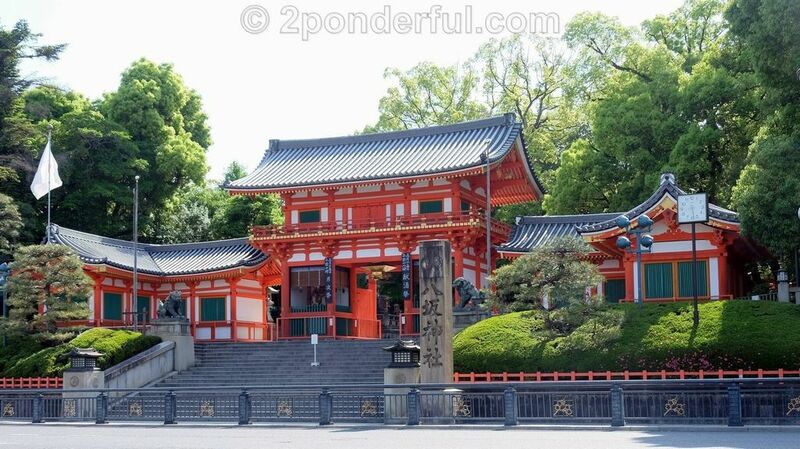 Yasaka-jinja is the headquarters for around 3,000 affiliated shrines nationwide. The Main Hall, designated an Important Cultural Property by the Japanese government, is a rare building in the shinden-zukuri Yoshiki style (an architectural style used for aristocratic residences, predominant during the 9th-12th centuries). This style is also called Gion-zukuri. This shrine is particularly popular with Japanese as a spot for the first shrine visit of the new year. Access : 10-minute walk from Gion Shijyo station on the Keihan line. The Gion-Matsuri festival, familiarly known as “Gion-san” is a festival of Yasaka Shrine. During the Heian period (794-1185), Kyoto suffered a series of natural disasters and plagues. As a form of appeasement to Mother Nature, a thousand years ago during a famine, purification ceremonies called “gouy-e” came into practice. Traditional spears were gathered from all over Japan as well as portable mikoshi (shrines) and offered to pay respect to the gods. One of the first of these ceremonies, Gion Matsuri, was held in the early Heian period at a time of devastating plagues. The highlight of the modern festival is the “Yamaboko Junko” parade. The Yamaboko, or giant wooden floats, are assembled without nails in the traditional Japanese way. These towering floats are so massive that they require more than 40 men to pull them through the narrow, winding streets of Kyoto. Each float is considered to be a moveable museum of history.